Stephen and Leann Ross who were honoured to receive the Children's Coach of the Year for 2015 at Saturday's Scottish Athletics awards. Stephen and Leeann Ross of Chirnside Chasers have been named as Scottish Athletics ‘Children’s Coach of the Year’ for 2015. The duo beat off the challenge of Eric Fisher from Edinburgh AC and James Joy from Aberdeen AAC to win the accolade at the Scottish Athletics Annual Awards Dinner in Glasgow on Saturday, where Steve Cram was the guest of honour. This followed on to Stephen and Leeann winning ClubSport Berwickshire’s ‘Coach of the Year’ award. Stephen and Leeann have transformed the junior section at Chirnside Chasers over the past two years. They have been responsible for implementing a culture of developing young athletes from multi-athletic events through to specialising in certain event groups while immersing themselves fully in developing themselves as coaches along with supporting other new coaches in the club. 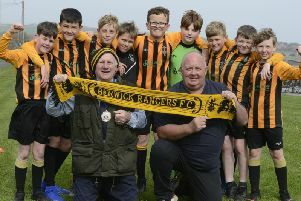 Chirnside Chasers is the only athletics club that has a junior section in Berwickshire and North Northumberland and now has members attending not from just the local Berwickshire area, but also from Kelso, Berwick and beyond. This award recognises their committed inclusivity, their ability to work with, support, encourage and train so very wide a range of ages and abilities and for their exemplary way of making athletics fun. It is not uncommon for 50 kids to turn up on a Monday night, 50-60 adult/kids on a Tuesday night and 25 at the Wednesday session. Not happy with that Stephen and Leeann now do a Thursday session with athletes who are competing in the throws and jumps and with competitions most weekends it makes for a busy week to be a coach at Chirnside Chasers.